Click the Developer portal button on the top of the Overview window. Alternatively, you can click the Developer portal URL link. On the upper left side of the screen, you see an icon comprised of two paint brushes. Hover over this icon to open the portal customization menu. Select Styles from the menu to open the styling customization pane. 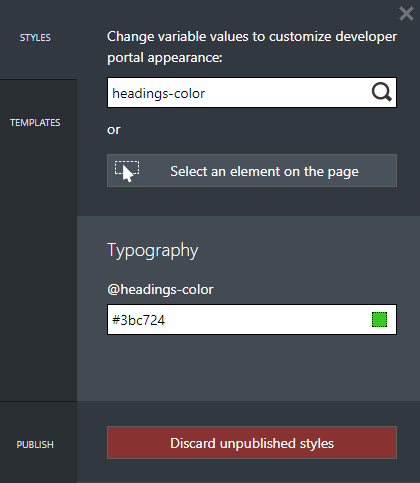 Enter "headings-color" in the Change variable values to customize developer portal appearance: field. The @headings-color element appears on the page. This variable controls the color of the text. Click on the field for the @headings-color variable. From the color pickers drop-down select a new color. Real-time preview is available for all changes. A progress indicator appears at the top of the customization pane. After a couple seconds the header text changes in color to the newly selected. Select Publish from the lower left on the customization pane menu. Select Publish customizations to make the changes publicly available. Navigate to the Developer portal. You can see the change that you made. 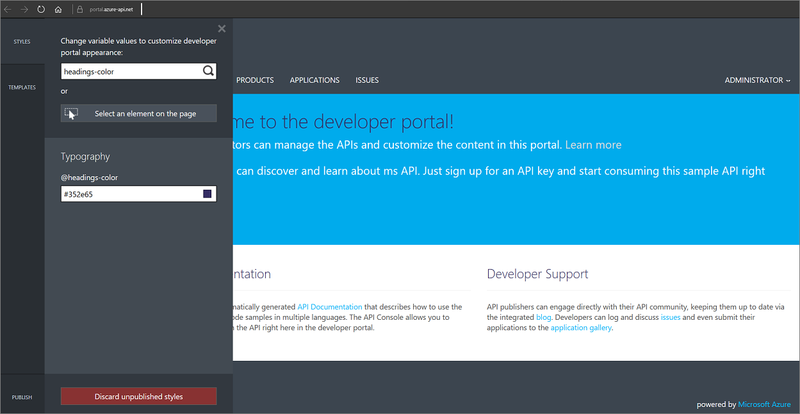 You might also be interested in learning how to customize the Azure API Management developer portal using templates.